There has been a lot of talk circulating around Twitter and Facebook lately regarding the mistreatment of animals at the Guzoo Zoo in Three Hills, Alberta. Don’t feel bad for the animals in the winter, they are much better suited to tolerate the cold temperatures then you might think. Instead, give our poor zoo keepers some sympathy. Regardless of the weather conditions, they must trample through snow, struggle with frozen locks, numb fingers and fight with the feed tractor which often chooses not to start on the REALLY cold days. Having to dress in layer upon layer of clothing makes movement all that more laborious. Shoveling snow out of gates and walkways, making necessary repairs to damage caused by board breaking winter winds, and trekking out into the various pastures to check that the automatic waterers have not froze up, are just some of the hardships of winter Believe me; the winter is harder on the humans at the zoo than the animals. 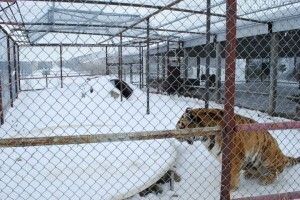 Other reported mistreatments include bad water dishes for the animals, injured animals, over abundance of animal feces, garbage within enclosures, dangerous objects within enclosures, food seemingly thrown over the fence for the animals to pick at, extremely small living conditions and exposing the animals to frigid temperatures for which they are not accustomed to. Much of what I have found on the Internet describes how many of the animals in winter do not have heated water dishes for winter and as a result of the water freezing, resort to eating snow. Another topic of discussion is that Guzoo apparently does not do much to help animals that are hurt or get into fights, and how animals that are killed are not cleaned up or dealt with, but rather, the corpses simply stay there for the duration of the season. This entry was posted on Monday, March 28th, 2011 at 4:30 PM and is filed under News & Announcements, Rants & Stories. You can follow any responses to this entry through the RSS 2.0 feed. You can leave a response, or trackback from your own site. If this place gets shut down, what happens to the animals? http://brokenha1o.redbubble.com/ The famous Nic Pictures….. Could they be REAL? I’m sure feeding rabbits FREAKING CROUTONS is ‘doing nothing wrong!’ This owner has NO IDEA what to feed its animals! The owner should be left out in the freaking cold! The problem what that theory is there is hundreds of other pictures and videos by different people to support Nic’s pictures. So now the man threatens to kill off the animals if he isn’t allowed to keep them. Seriously, why does it have to be “his way or the highway?”. Could these animals be removed forcibly, placed into proper sanctuaries without his jackass arrogance around playing by his rules? 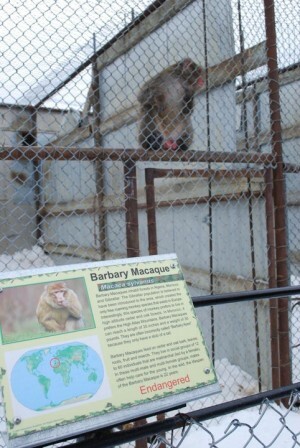 There are a whole host of animal sanctuaries that have been lined up to take the Guzoo’s animals, free of charge should the place be shut down. A lot of people on a facebook group support the closure of the Guzoo have worked very hard to secure alternate arrangement to Mr. G killing them. As for Nik’s photos, yes he is a photo manipulation artist. His 20 pictures can’t compete with 1200 taken by anyone but him. That argument is getting old. It deflects from the real issue, which is the lack of care of these animals. To add onto my previous post, be sure to use the take action button and send emails and sign the new petition to Stop the GuZoo Taxidermy Slaughter, it is super quick and easy!